Yup so we've gotten kind of slack with the blogger posts but we've had an abnormally busy fall season and we're not about to complain about it. Rock climbing has been busy every weekend, we've run several Canyoneering trips and Kevin and myself spent 3 days in Joshua Tree updating all of our AMGA qualifications to keep our skills top notch. Plus it was a great excuse to do some climbing in the amazing climbing mecca of J-Tree with one of the rock legends Bob Gaines. We've got an extremely busy few weeks coming up to close out 2010 with a bang and provide our clients excuses to get off their couches during the winter and spring of 2011 and spend some time with TST on local crags in Southern California. Starting on Tuesday November 30th we will run a 3 day promotion with Groupon on their holiday website (Groupalicious) for climbing in Mission Trails and Dixon Lake for $55 (Groupalicious Link). If you've climbed with us before come out again and we'll take you on different routes or use this as a good excuse to climb at a new area in North County on the beautiful Dixon Lake. We will also officially debut our newest climbing site in the Inland Empire at Big Rock on Lake Perris on December 13th. We'll be offering the same deal there on the Inland Empire Groupon so check it out if you're interested. Also keep in mind a TST gift certificate is a great Christmas present so inquire about one today. First off I'd like to tell everyone to check out our newly redesigned rock climbing web pages that we have up that now include the sites of Lake Dixon in North County San Diego and Big Rock in the Inland Empire on Lake Perris. So on a slow day at work go here and tool around a little http://bit.ly/afXqWy also read about our two newest rock guides. In addition to offering 20% off if you mention reading this post on climbing at both of these new sites we are also launching another Groupon Rock Climbing promotion on November 19th that will run for 3 days. This first promotion will be on the Inland Empire page http://bit.ly/aVkOWo and will be for Big Rock. We will be offering our 4 hour session for $55 which is over 50% off. For those of you in San Diego it may be a bit of a drive (close to an hour) but if you're up for something new it's an awesome place to climb for all ability levels. Also keep an eye out for Groupon's holiday specials that will begin running after Thanksgiving, we will be featured the first week of December for a week with rock climbing deals for both Mission Trails and Dixon Lake. Stay tuned I'll post more information as the date comes closer. So check out our pages, buy some climbing sessions and attack the Groupon offer and we'll be seeing you on the rock soon. 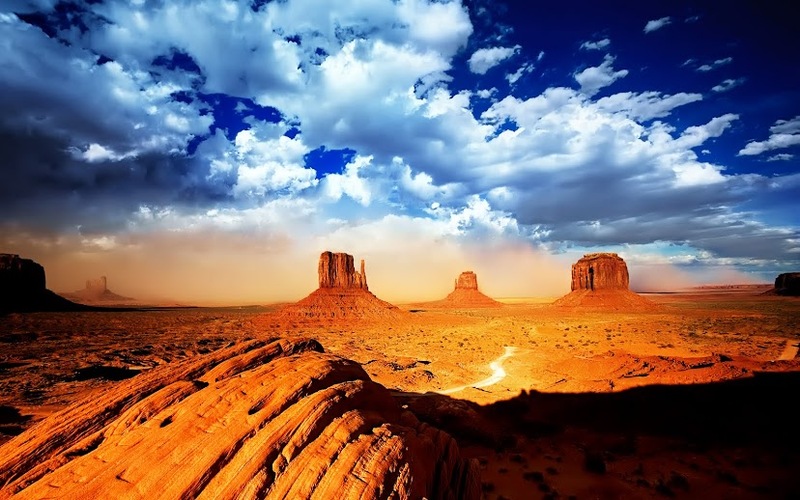 Volcanoes, Canyons and Rock yup it's all in there, check out the news. To all of you devote followers, there's probably only 2 or 3, here is an incredible video from one of our summit teams in September up Mount Kilimanjaro. It's hard to say what's more exhilarating the feeling of being on top of Africa, the 3 different ecosystems you travel through to summit or the culture and people you meet and are exposed to on the way. Our luxury and base adventure trips up Kili are the best in the business, with our training plans and guide to client ratio we give you the best chance of making it to the summit. The best part is you'll have great meals, facilities and entertaining all the way up. Enjoy the video and when you decide you want to summit one of the great 7 summits just think about The Southern Terrain. After some careful reading, heavy analysis of topo maps, looking at pictures and trip reports I planned a two day excursion out into the deserts of Northeastern San Diego County to scout for some local Canyoneering. Everything in the Anza-Borrego desert East of Julian looked pretty intense and some of the canyons looked very tempting so I talked Joshua into jumping in the car with me and heading out for some exploring. I'm not sure how many of you have been to this area but wow what a change you see as you leave the forested mountain ecosystem of Julian and descend into the desert of Anza-Borrego park. It's a great drive on the 78 and I highly recommend it as a great 1 or 2 day get away from city life. You immediate feel very desolate but at the same time you're surrounded by mountains, valleys cliffs and lots and lots of sand. It's amazing that all of this used to be the ocean floor and if you look in the right areas you can even find seashells and some of the most preserved fossils in the world. So after a short drive out of Julian we headed to our first site we wanted to scout out and were very impressed at what there is to offer. What's a better way to start your day then a 150 foot rappel off a sandstone cliff? After a couple mile drive up a very impressive wash where you're passing wind caves, hills and mud cliffs you come to a canyon that was as awesome as we had hoped. 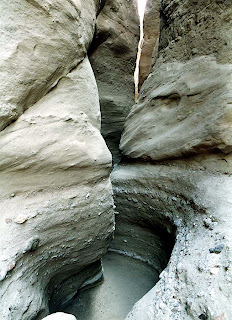 This unnamed canyon is going to offer us to build an incredible trip with several rappels down into it and a very exciting hike through and out the end. This was just our first day and I was pretty excited about what this region has to offer. We explored several more canyons on the second day and will be finalizing this trip by the end of this year. 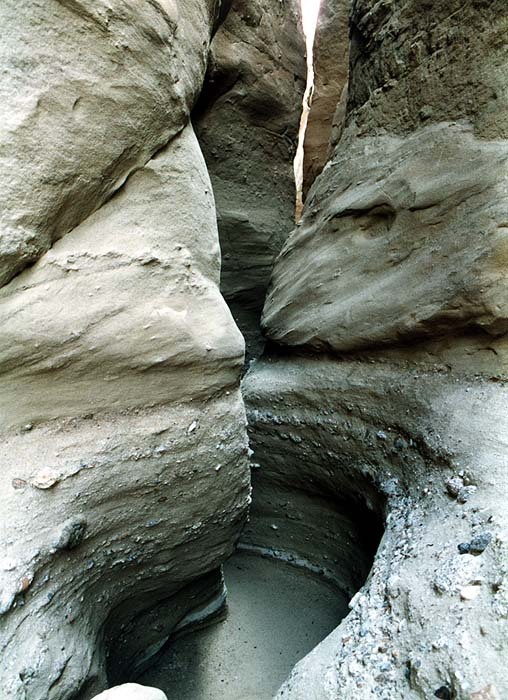 Beginning in the Spring of 2011 TST will begin offering 1 and 2 day Canyoneering trips to Anza-Borrego Canyons. We will also be offering an overnight backpacking trip that will start in the highlands near Julian and Lake Cuyamaca and descend into a stunning canyon on the backside of the desert.